four + 4 = Required Please enter the correct value. When Apple Inc. (Nasdaq: AAPL) stock plunged about 6.4% in one minute this morning, befuddled Wall Street analysts came up with a lot of unlikely culprits. Some blamed a Morgan Stanley downgrade, or profit-taking. Or weak Black Friday sales. All of this is obviously grasping at straws. Nothing the analysts suggested would make a widely held stock like AAPL sink more than 6% in a minute. 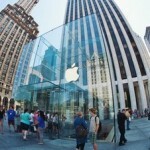 As Apple Inc. (Nasdaq: AAPL) stock continues its seven-week tumble, investors want to know what is likely to happen next. Since hitting an all-time high of $702.10 on Sept. 19, Apple stock plunged $155.04 --more than 22% to close at $547.06 on Friday. Investors have gotten little help from Wall Street analysts, who have offered diametrically opposed opinions on where AAPL is headed. Among the prominent bears is Doubleline Capital CEO Jeff Gundlach, who predicted on Thursday that Apple stock would continue all the way down to $425. He said that's about where AAPL was when it started its dramatic climb in January, and he expects it to return to those levels. Gundlach is down on Apple because he thinks the Cupertino, CA-based company's new products are no longer cutting edge. "I'm really struck by this mini iPad thing as if that's any kind of a product innovation," Gundlach told CNBC. "Once you just start changing the size of your products, I really think you're not exactly innovating." Meanwhile, some Apple bulls insisted the stock will not only bounce back, but eventually will reach beyond $1,000 a share. Brian White, an analyst with Topeka Capital Markets, said in a note to clients on Thursday that he's keeping his $1,111 price target on AAPL. "We believe that those investors that have missed the Apple rally over the past year are presented with a very attractive entry point heading into the strong holiday news season," White wrote. So which story are Apple investors to believe? To figure that out, let's take a closer look at what's been going on.